If you have ever put together a European or Asian model you have probably experienced the need to have access to a “Phillips” head screw driver. I do a lot of mechanic work on my farm and I am a big fan of Craftsman tools. But even if you do use quality tools these American National Standard Institute (ANSI) drivers do not fit metric screws. They seem right, but they are likely to cam-out when the turning gets tough. There is a difference in metric and ANSI screws heads with a more rounded and slightly shallower center on the ANSI head. This was actually designed into the screw head so when you reached maximum torque your driver would in fact cam out. JIS screw heads are deeper and have a more crisp center cut. The problem is the ANSI driver just will not go deep enough to reach into the JIS metric head and that is where the issue of slipping starts. Metric screws in projects are almost always provided as the JIS (Japanese Industrial Standard). JIS tips have an extended tip and a more intimate fit with the screw head tip so it won’t cam-out). You will find that the ISO metric performs much better than forcing an ANSI standard tip into a metric screw. One of the best purchases I have ever made was to get a JIS set of screwdrivers. Ask at your local hobby shop for one of these and I can assure you will immediately feel the difference. Several years ago, JIS were recommended to me by my local hobby shop. They are just incredible. They are actually competatively priced and the two I picked up back then still work flawlessly today. Never knew that, no wonder I have been stripping all my Chinese-screw laden parts using Craftsman drivers! Thanks for this! Going to order some JIS drivers right away. Once you use the JIS you will never look back. They really work great. Not wishing to bash the ANSI standard but the Japanese JIS screw drivers and screw heads, after working on some demanding Japanese models that required remounting of some servo cases to metal brackets as well as umpteen zillion screws in frame parts, are simply better engineered and work together with such great precision that you, the builder, have greater command over the fit of the assembled parts. All you need on top of that is a good command of the right thread lockers for the details, and the structural integrity of your model can be dialed in with amazing precision, strength and, I’d even say, artistic finesse. A file can fix that rounded part. what’s funny about this post is that many years ago I learned there were several different cross tip screwdrivers. 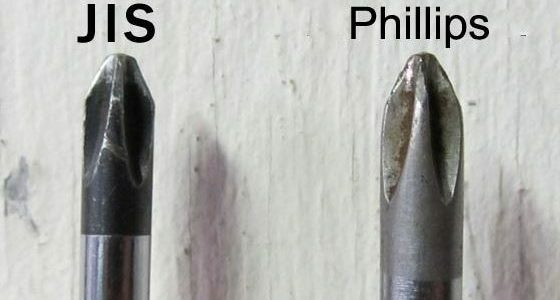 One had a point similar to what is described as a JIS in this article it was called a Reed and Prince point the other was called a Phillips point. You can go to any hardware store and by looking at the tip of the screwdriver determine which is which. My read and Prince screwdrivers have always worked on my models since I began modeling in 1960. This is the first I have heard of JIS and it answers a lot of puzzlement. Anyway, I had taken to grinding the regular Philips with a bench grinder and that works pretty well, although a JIS could well be better. Recall the saying, ” You learn something new everyday.”? I been flying/building since 1974 and never heard of JIS drivers!! Guess now I can make my life easier and order a couple, and stop screwing up screw heads!! Great article / tip . 1-question ? As little as a screwdriver cost ? Why would anyone take a chance on filing or grinding one that may work ??? 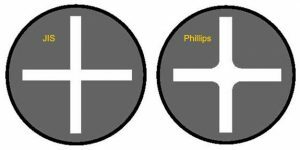 You mention European Phillips, I believe Phillips to be more English and the Europeans use another type Pozidrive. Pozidrive head screws are easily recognised as they have a faint X stamped between the drive slots. They really need their own driver as Phillips, ANSI etc will slip. Check Vessel tools. They import very good quality Japanese (JIS) tools. Also check the screwdriver bits at the hardware store for ones labeled PH. As in PH1,PH2, or PH3. They are very close to JIS and work well. If you buy Cross head screwdrivers at Harbor Freight they are JIS as they are made to JIS standards as they comply to those standards. They work very well and are not expensive. Where can you get the J I S screwdrivers?